Launch or remediate utility, security, and non-fungible tokens. 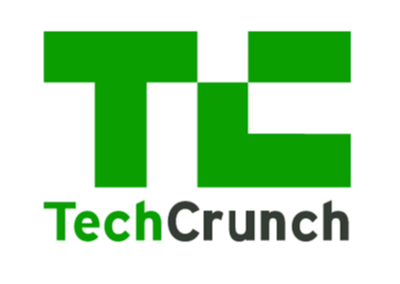 World-class digital identity verification for individuals, corporations, and accredited investors. 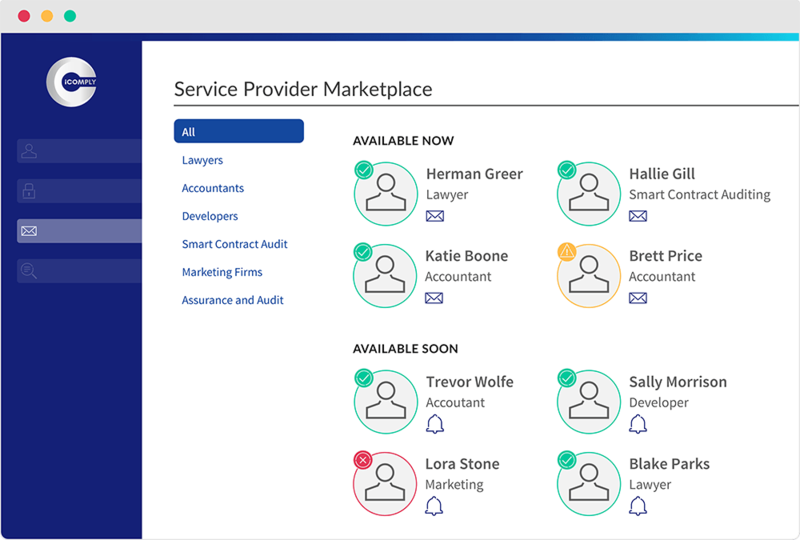 Manage multiple STO or ICO offerings on a simple SaaS platform. No setup fees. No success fees. Free access to iComply’s Global Gateway network of partners for qualified products and services. Security tokens for equity, debt, options, real estate, and fund units. Utility tokens for community memberships, loyalty programs, or network access. Non fungible tokens to represent physical assets, online gaming credits, carbon credits, etc. 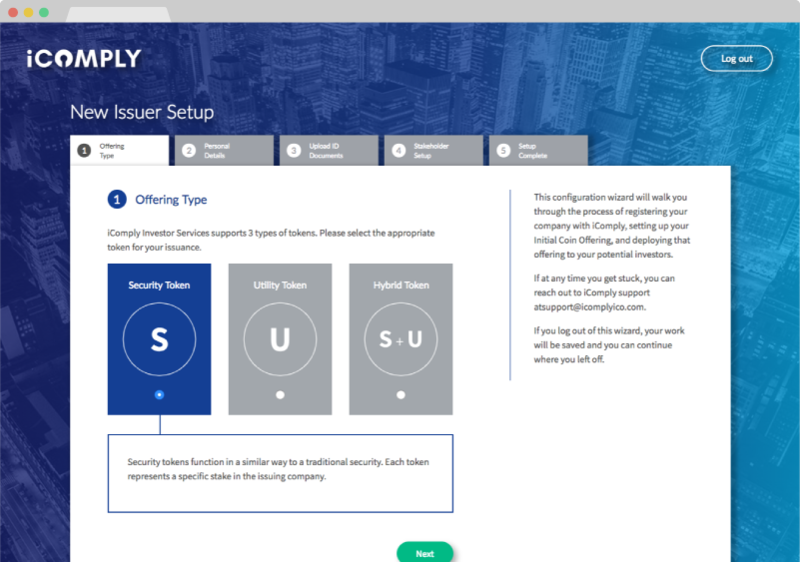 iComply provides issuers with a step-by-step workflow automation, compliance, and risk management. 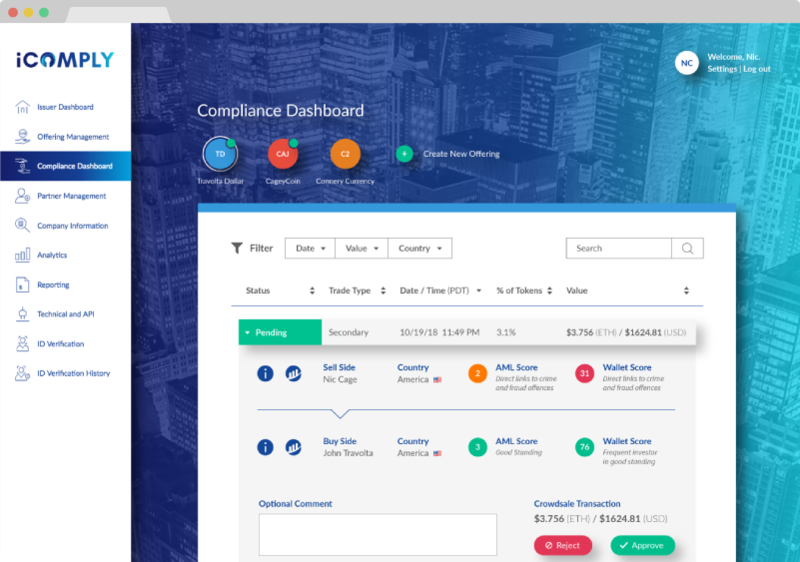 Leveraging both iComplyICO and iComplyKYC for financial risk and intelligence data with our patented Prefacto technology to manage counterparty risk in the live secondary markets of ICOs, STOs, and other regulated digital assets. Each software license can be used to streamline your presale, live crowdsale, and secondary trade monitoring for an unlimited number of tokens. iComply is the only solution in the world capable of maintaining compliance for both initial offerings and secondary trading of utility, security, and non-fungible tokens. Liability extends beyond the initial offering… We provide clarity & confidence. ONE STOP: ID, KYC, AML, ATF, Blockchain Forensics Verify corporations, accredited investors, and venture funds by performing compliance checks on leadership & company on a country-by-country basis. Issuers can manage the entire compliance workflow of a global offering in one place; saves time, money, and reducing risk, while providing Investors with information and confidence. 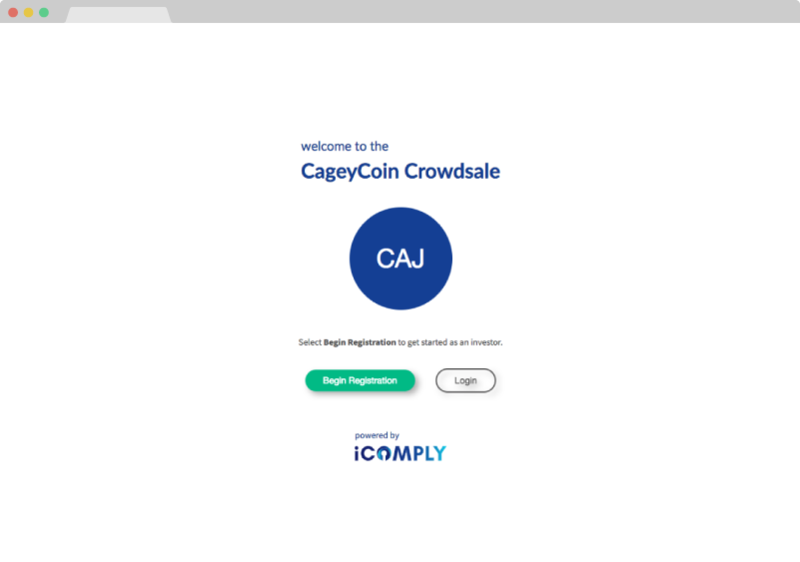 TRANSACTION MONITORING Utilizing iComplyICO’s patented Prefacto™ technology enables you to manage your smart contract rule sets by country with automated approvals, rejections, or escalate for a potentially risky trade for manual review. Unlock the true power of public blockchains with autonomous record keeping and reporting. Own your token data and track all transactions and investors in a single dashboard. 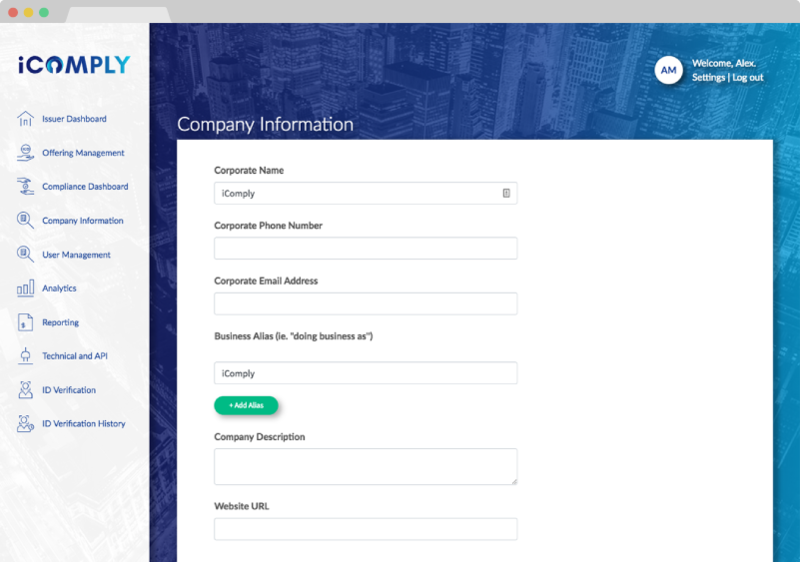 iComply provides a single interface to monitor and manage the ongoing compliance and reporting needs of your business. Comprehensive Source of Funds reports for every investor in your offering meet standards such as FinCEN, SEC, FINRA, FINTRAC, FCA, MAS, etc and help when….not if…you are audited or need to open a bank account. Need help or advice preparing your token offering for a specific jurisdiction? 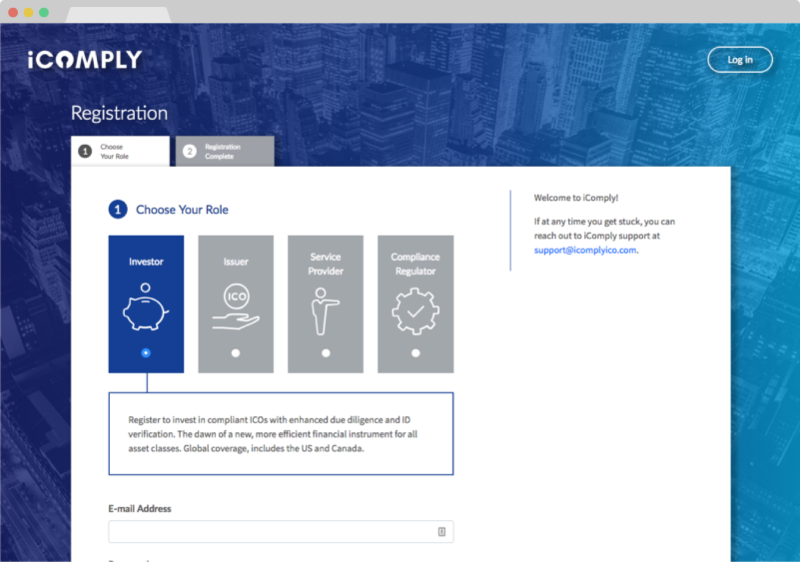 iComply offers a free and open marketplace of industry-leading legal, compliance, marketing and technical experts from jurisdictions around the world to support your offering! Ready to Get Started with iComply? Access to global capital and liquidity is only a few clicks away. Easy to get started today. Follow the simple forms to prepare your account. Talented iComply team members will assist from here to get you started. 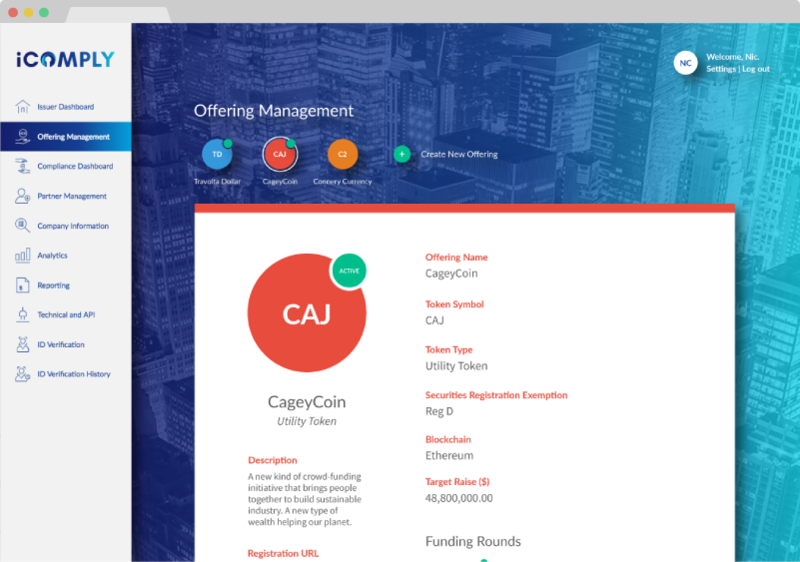 Configure Compliance Settings, Regions, and Offering Documents, matched with regional and global Utility Token & Securities regulations. Manage Your Token and access industry leading advisors globally to support your ongoing legal, tax and community management or investor relations needs.